Thank you for visiting Fashioned4You2! Announcement All items in my shop are available for rush! Please search my listings to add the rush option to your purchase and it will be shipped within a week (does not include transit time). All items in my shop are available for rush! Please search my listings to add the rush option to your purchase and it will be shipped within a week (does not include transit time). 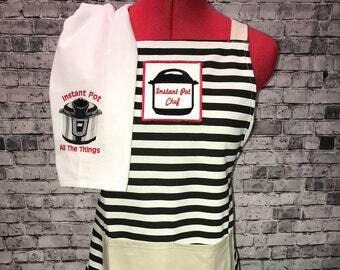 Instant Pot Chef Men and Women apron, create your own! Complete customization available! Personalized Custom Instant Pot Cover Pressure Cooker - more colors available!! My 5-year-old loved it! Quick shipping, adorable item, exactly as ordered. I placed a custom order for blue fabric instead of red. That wasn’t the best call on my part. When you write the tooth lost date on the diagram, it doesn’t show up well. Totally my fault. Just something to keep in mind if placing a custom order for the fabric color. Thank you so much for customizing this tooth fairy pillow for my daughter! She loves it! It is exactly what I was looking for and very adorable! Great quality! I love the tooth diagram. Adorable! I can't wait to see my little boy in it at his birthday party. Thank you for visiting Fashioned4You2! I love to create customized items and make special occasions perfect! Pretty much anything in my shop can be completely customized and personalized upon request! Let's create together! There are no refunds on personalized items or customize sized items (unless there is a gross error made by the shop). All customized items take 2-3 weeks to ship. This does not include transit time!